The Trial of Ratko Mladic, the worst times in Europe since the Second World War and the man at the heart of them. On the 22nd of November 2017, the Bosnian Serb general, Ratko Mladic, was found guilty of genocide and crimes against humanity at the International Criminal Tribunal For The Former Yugoslavia (the ICTY) in The Hague and sentenced to life in prison. 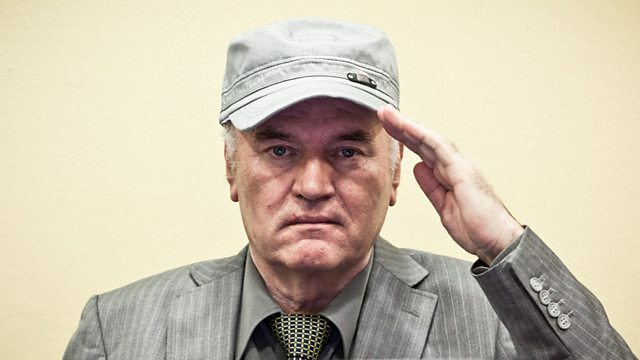 Mladic was one of the most infamous figures of the Bosnian war of the 1990s and became synonymous with the merciless siege of Sarajevo, in which 15,000 people were killed or wounded, and the murder of over 7,000 Muslim men and boys in Srebrenica in 1995 - the worst crimes on European soil since the Second World War, Mladic was not a distant participant in these crimes – he was in Srebrenica when his Serb forces took control of the town and watched as the men and women were separated. He looked his victims in the eye and promised that no harm would come to them. Filmed over five years, directors Henry Singer and Rob Miller were given unprecedented access to film behind-the-scenes with prosecution and defence lawyers in Mladic’s historic trial – one of the most important since Nuremberg - as well as with witnesses from both sides who were called to give evidence. The lawyers were working under immense pressure – the prosecution were charged with delivering justice to thousands of Mladic’s expectant victims, while Mladic’s lawyers saw the trial as indictment not just of their client but of the entire Bosnian Serb nation, a nation to which they also belonged. Intercut with the narrative of the trial, the film follows contemporary stories in Bosnia, a country bitterly divided along ethnic lines where the land is steeped in the blood of historic conflicts. These included the discovery of the one of the largest mass graves from the war, which prosecutors felt might be instrumental in proving one of the two genocide charges against Mladic; and the story of a young Muslim woman still looking for her father twenty years after he was dragged away from their family home. The film also spends time with Mladic’s supporters who congregate every year near Mladic’s birthplace in Bosnia to celebrate and mythologize the man they regard as the savior of the Serb people. These rallies are attended by Mladic’s wife and son who provided the film-makers with access to their inner circle. They reject the allegations made by the court and extol an alternative view of Mladic as man of truth and integrity. The Mladic trial was the last to be held at the Tribunal, which was established by the United Nations in 1993. As a result, the film also asks important questions of the court itself - not least, while the court boasts an impressive record of holding all of its 161 indictees to account, can it really claim to have delivered peace and reconciliation to Bosnia? Capturing the final, momentous act in the Bosnian war, The Trial of Ratko Mladic tells an epic story of justice, accountability and a country trying to escape from its bloody past.